Why you should be eating more cherries. the best news is that they are bursting with nutrition and are good for us ! So, it came as a very welcome news to me that these little red things are extremely healthy to eat. The red colour comes from anthocyanin, an antioxidant that helps to ease aching joints. Cherries also lowers uric acid levels as well as reduces C-reactive protein. Which plays a role in gout and arthritis. 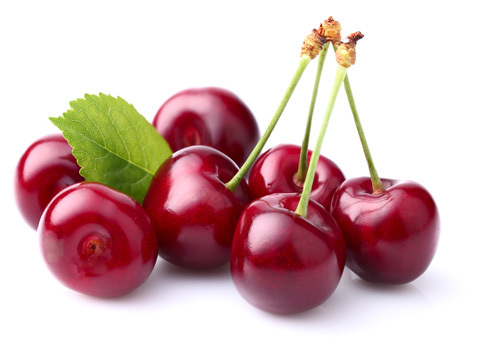 As a result cherries juice may also help for post-workout pain, according to a 2010 Journal of the International Society of Sports Nutrition study. It seems that the antioxidants in cherries protect us against attacks by exercise-induced free radicals, which in turn leads to painful post exercise inflammation. It seems that calories ingested from carbohydrates, might be neutralized by cherries and the body gains less weight and body fat, because, the anthocyanins in cherries stimulates fat burning and decreases fat storage. Another ingredient, quercetin, a favonoid, is anti-carcinogenic and protects your colon against cancer. Cherries are one of very few fruits that contain melatonin. This improves your sleep pattern. Cherries are one of nature’s few sources of melatonin, that makes us sleep. When study volunteers drank an ounce of tart cherry juice concentrate in the morning and again at night, they slept more soundly. Even better: melatonin in cherry juice is very well absorbed and is utilized by the body and provides an effect that equals melatonin supplements. Cherries are one of the very low calorie fruits and are rich in phytonutrients, vitamins, and minerals. Cherries are rich in pigments, which are are polyphenolic flavonoid compounds also known as anthocyanin glycosides. Anthocyanins are red, purple and blue pigment found in many fruits and vegetables. Cherries are also a small source of zinc; iron, potassium, manganese, and copper. Furthermore they are also very rich in flavonoid poly phenolic anti-oxidants such as lutein, zea-xanthin and beta carotene. These in turn protects us against harmful free radicals that play a role in macular degeneration of our eyes. So, be happy, go shopping and eat as many cherries as you like ………. IT’S GOOD FOR YOU !! Previous Post: Compression Stockings & Pantyhose. Next Post: Generation Y …. whinging with reason ?